Our chocolate Fountain stands at 27″ above the base. During your event, Flossy Treats will produce unlimited top quality Belgian chocolate available in milk, white and dark. We will deliver at a time that suits you and an experienced uniformed member of staff will operate the machine throughout the required time period to ensure the smooth running and ease of use. We will supply napkins, forks, plates and skewers and of course, your choice of dipping selection. Choice of dips include; strawberries, bananas, pineapple, grapes, marshmallows, profiteroles, mini doughnuts, brownies, shortbread, pastries, fudge and popcorn. We have other dips available on request. All you have to do is tell us what you like! 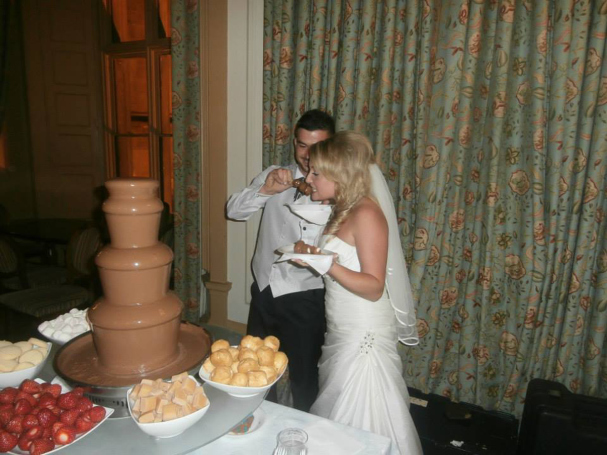 We will arrive at your venue, usually an hour before you want us to start, and set up your Chocolate Fountain quietly and discreetly where you want us. Any fruit is delivered to us fresh on the day from our local supplier, and prepared just before coming to your event, along with all your other dips, to ensure maximum freshness. When everything is ready, our staff will let the bride and groom know and allow them to have the first dip, which makes for a great photo opportunity. Then everybody else can tuck in and use it as much as they like for the duration.